Thread: Handy Sewing Machine "Place Mat"
Went to a quilt show in Milford PA yesterday. Very nice and found a neat item for sale. It is a kind of place mat with pouches across one side. Maybe others have seen this but I never did. Bought one and you put it under the sewing machine with the pouch side hanging in you lap area and there is a place for the scissors; seam ripper; pins; stiletto or what ever you want. 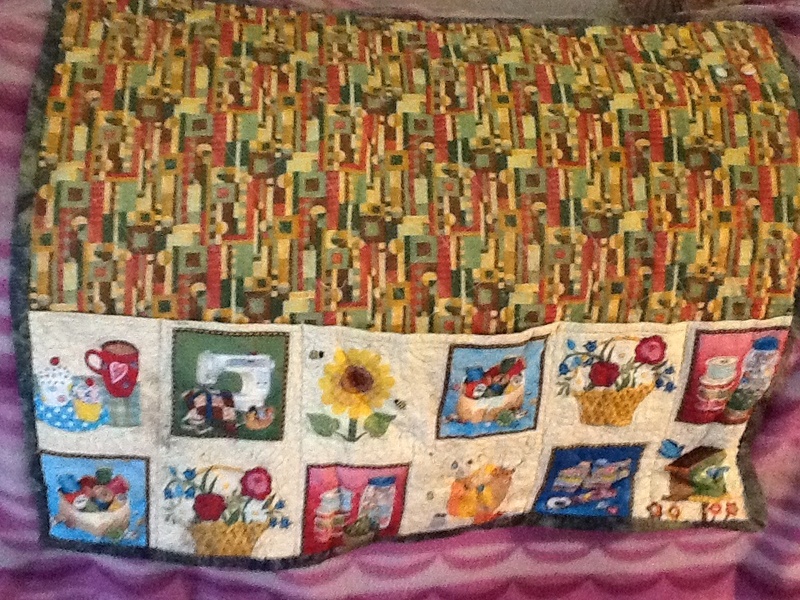 I think it is great and it is already under the sewing machine. They are great to have. There patterns about. Mine is from my head because it was made to compliment the pocket fabric. Dottymo: I love the one you made! I have something similar but I don't use it under my machine for two reasons: my machine has suction cups for feet that keep it glued to the table, and those front pockets block entry to my desk drawer where I keep all my scissors, notions, and tools. However, my pocket pad is made with heat-resistant materials and is designed for pressing, so I set up another table to the side of my desk in an L shape. Now I can sew, turn and press seams.